A new report was just released by the National Renewable Energy Laboratory (NREL), on behalf of the Energy Department’s Office of Energy Efficiency and Renewable Energy, exploring and illustrating US + global energy statistics over the 2013 calendar year period. The report — the 2013 Renewable Energy Data Book — provides data on renewable electricity generation + development, clean energy investments, and technology-specific data + trends. 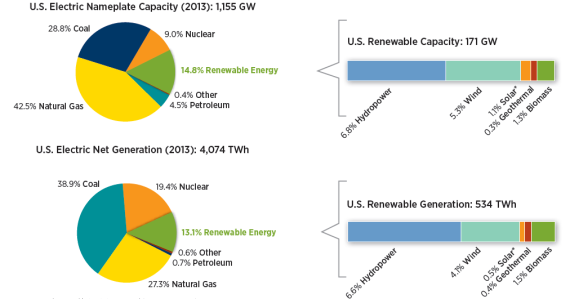 Renewable electricity, including hydropower and biopower, grew to nearly 15% of total installed capacity and 13% of total electricity generation in the United States in 2013. 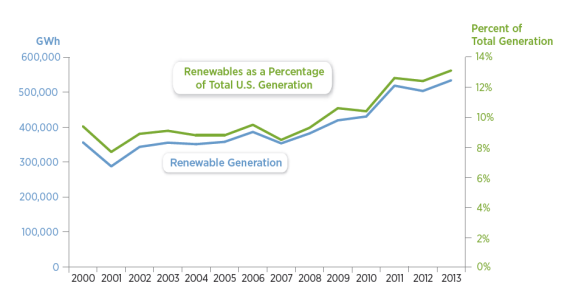 In 2013, renewable electricity accounted for more than 61% of all new electricity capacity installations in the United States. In 2013 in the United States, solar electricity was the fastest growing electricity generation technology, with cumulative installed capacity increasing by nearly 66% from the previous year. 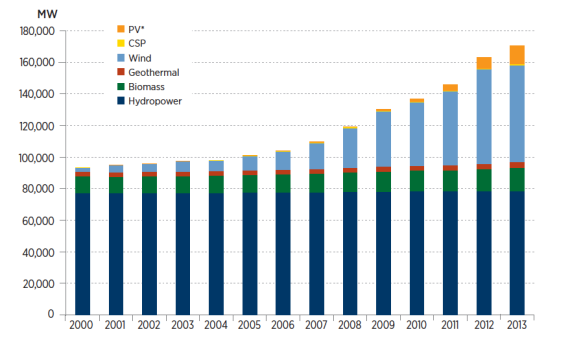 Renewable sources accounted for 23% of all electricity generation worldwide in 2013. The 2013 Renewable Energy Data Book was produced by NREL’s Strategic Energy Analysis Center. It is available for download here. NREL also just recently released two reports on the economic trade-offs of owning rather than leasing solar photovoltaic systems, with regard to both residential home systems and larger commercial systems. Those two reports are: Banking on Solar: An Analysis of Banking Opportunities in the US Distributed Photovoltaic Market + To Own or Lease Solar: Understanding Commercial Retailers Decisions to Use Alternative Financing Models.